With a tamarind and peanut butter dipping sauce – plus an exciting meal kit announcement! Before we begin, we want to share the exciting news that we’ve collaborated with Screen to Plate to bring you this recipe as a meal kit! This means when you buy a meal kit for one of our recipes, some of what you pay comes back to us. 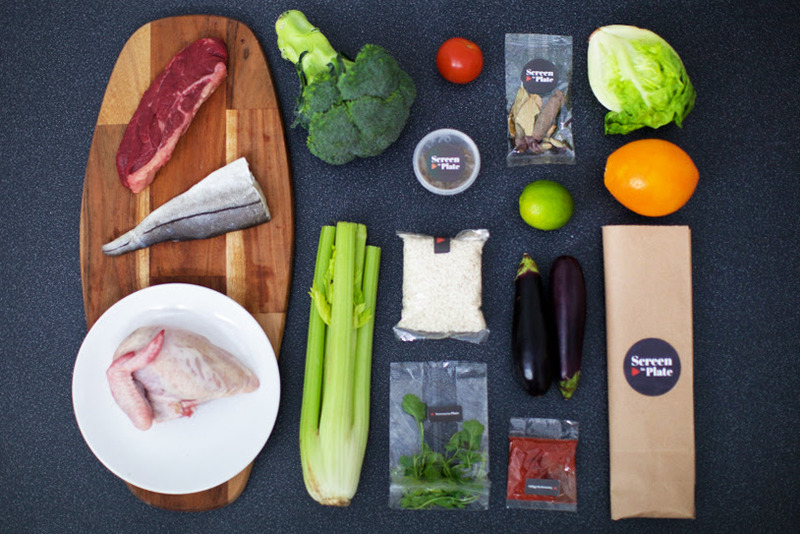 Order your meal kit here and find out more at screentoplate.com. Until 13 November 2018, get £10 off your first order over £30 with the code FIRSTBOX10. If you’re reading this, it’s probably because you share our love for food. Apart from the pure joy of eating something delicious, we also love food because it unlocks memories. Trips to the dim sum restaurant, helping mum make giant batches of dumplings and her expansive home-cooked feasts were highlights of our childhoods that we strive to recreate as adults. And of course, we love cooking. 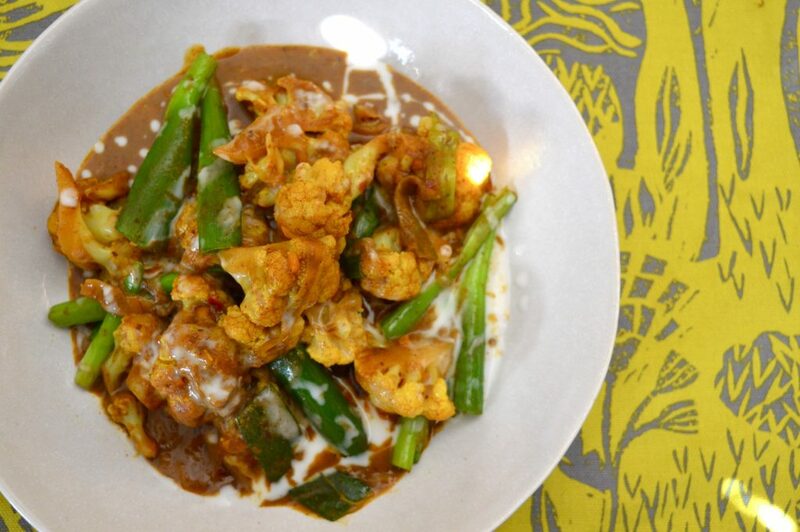 Despite living in the multicultural metropolis of London with its array of culinary temptations, we cook at home much more than we eat out, and a lot of the time our meals feature Chinese ingredients. When we come across others who share our passion, the mutual appreciation for one of life’s greatest joys is like a binding force. We may have nothing else in common, but if we can talk about our favourite ramen shop in London or simply share a look of understanding about the virtues of pork belly, then the interaction feels as effortless and sinking your teeth into that pork belly. 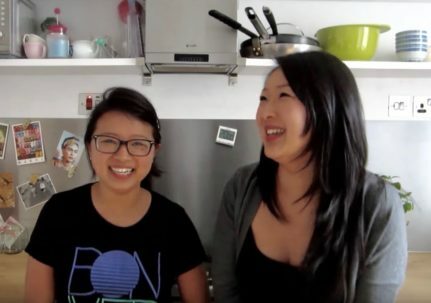 That was the case when we first met with Tom, a true foodie and, it turns out, a Dumpling Sisters follower for years! 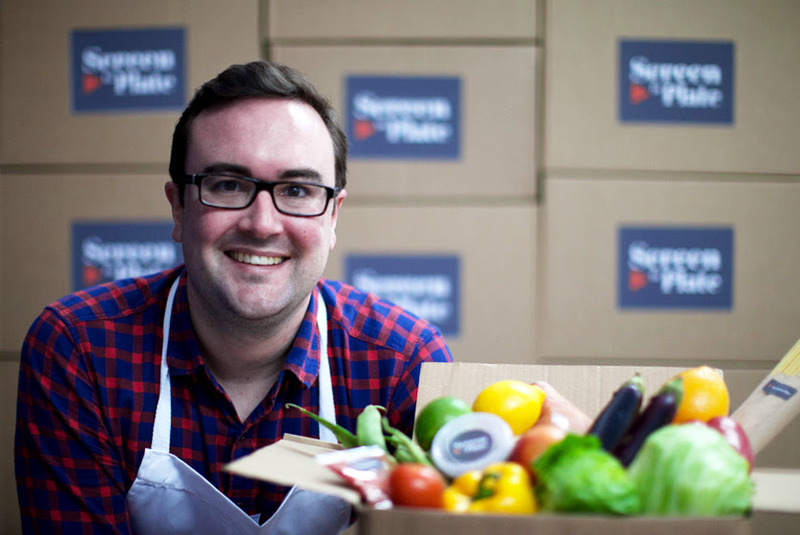 He told us how he and his friends decided to quit their day jobs to follow a more fulfilling path of running their meal kit business. Now, you might be thinking (as we were!) that there are so many meal kit companies, how will this be different? Well, the hint is in the name: Screen to Plate. The guys behind Screen to Plate want to help you recreate the recipes that you see on online, in your own kitchen. If you’re like us, you probably feel inspired by recipes on YouTube, blogs and social media all the time. Maybe you mentally file a meal idea away for when you next have time to try a new recipe, but it gets lost amongst all the other ideas that once caught your attention. Perhaps you’ve even done that with one of our recipes (we won’t hold it against you!). The hassle of shopping for ingredients, often in inconvenient quantities, is enough to hold us back from committing the time and energy to trying something new. And that is why meal kits have really taken off, because exact amounts are delivered right to your door. We think what makes Screen to Plate different is that instead of creating meal kits for recipes they think you want to cook, they work with people like us to bring you recipes that they know you’d enjoy cooking! Plus, each recipe has a video to follow, saving you the trouble of interpreting the recipe card. So when Tom asked us if we wanted Screen to Plate to turn our recipes into their meal kits, making it even easier for you to make them at home, of course we said yes! For the Screen to Plate launch, we’ve created a special new recipe: our classic pork potsticker dumplings streamlined for a midweek meal. We’ve added garlic chives to the pork filling, which are like a vegetable/garlic hybrid that delivers loads of flavour. The meal kit also includes ingredients for a dipping sauce made from tamarind paste and peanut butter (yes, it’s a flavour explosion!). And as you’ll see in the video, we demonstrate a simplified pleating technique that halves the time it takes to get your dumplings on the table, so they really are doable for any night of the week. 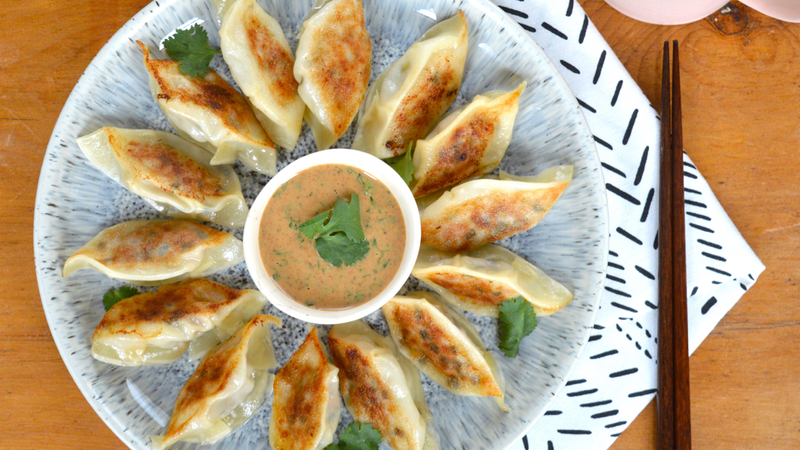 The dumpling wrappers are also the best we’ve ever have tried (we tested loads! 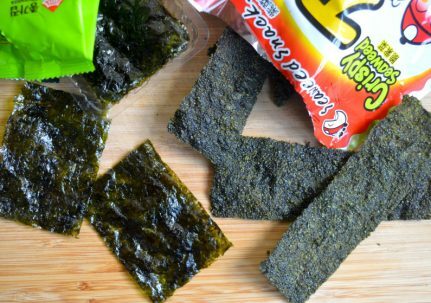 ), because nothing is more disappointing than a chewy store-bought wrapper. But that’s not all! 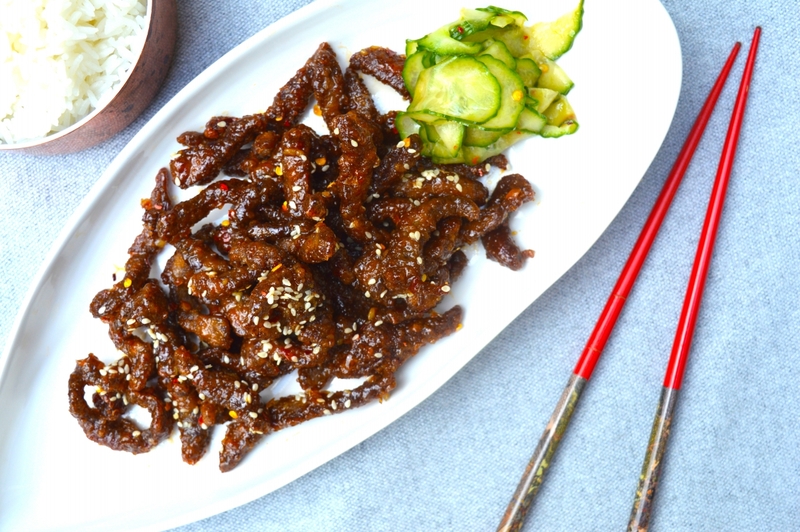 Our popular Crispy Chilli Beef and One-Pot Cauli Satay are also available as meal kits, and there will be even more coming soon. 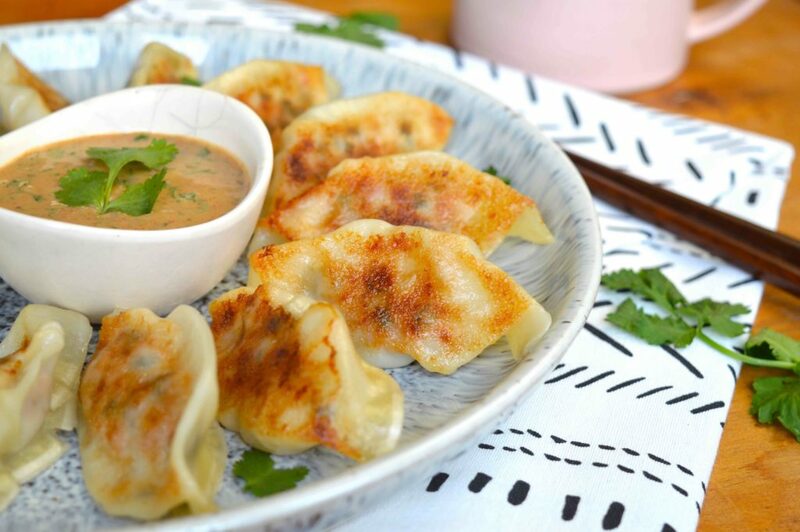 Head over to Screen to Plate now to order your choice of Dumpling Sisters meal kit, and browse all the other fabulous recipes on offer. 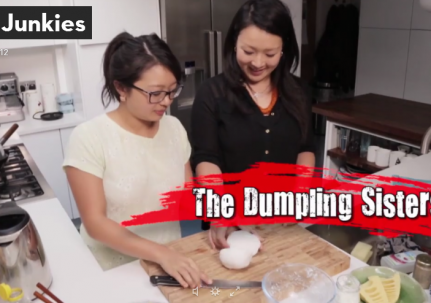 Finally, if you have a particular Dumpling Sisters recipe that you’d like to see in a Screen to Plate meal kit, just let us know in the comments below! Place the ingredients for the filling in a large bowl with 3 tablespoons of water, and stir in one direction (e.g. clockwise) until the mixture resembles a paste. To assemble the dumplings, first fill a small bowl with water and set by the wrappers. Then follow one of the #pleatcheat wrapping techniques in the video, depending on how hungry you are! Keep the finished dumplings under plastic wrap to prevent them from drying out. Heat a dash of oil in a frying pan over a medium heat. Arrange the dumplings in the pan so they are at least half a centimetre apart, as they will expand as they cook. You may need to do this in batches. For each batch, when the undersides of the dumplings are golden, pour in 100ml of tap water and quickly cover with the a lid (or a plate will do). Let the liquid bubble away for 4-5 minutes. Meanwhile, in a small bowl, combine all the ingredients for the dipping sauce and set aside. Take the lid off the frying pan and allow the remaining liquid to evaporate, and the undersides of the dumplings to dry out and crisp up again. Serve with the dipping sauce.